Last Christmas as part of my stocking fillers I got an HC-SR04 ultrasonic distance sensor. Like most of my electronic bits it's a cheap generic device from ebay. It's a small sensor that is suppose to do the same thing as the Ping sensor but for less money. I finally unwrapped it and found a library for Arduino IDE 1.0 at HERE. There is even some sample code to read the HC-SR04 and display the results on an LCD display. Since I don't have an LCD display (yet) I modified the code to use the Serial Monitor as the output. This worked great up to about 16cm. But beyond that it started to give me some random numbers greater than 4000, so I'd expect not very robust. I continued my search and found the following code that doesn't use any library, and this code even does the Serial Monitor as the output so no modification needed. This code performed better, working out to about 24cm. While doing my research on using the HC-SR04 I did find a post (somewhere...) stating that when powering from USB the 5V line can be a little bit off so this might be part of my problem. But, using either method I have a sensor that is good up to 15cm which could be good enough for a small autonimous robot as if I'm within 15 cms I will need to look around for another direction. NOTE: If you are using a version of the Arduino IDE before 1.0 then at the following LINK you can get the relevant library. It looks like it's the same as the 1.0 library and has similar performance. The hunt is on to see if there is a way of getting a reading beyond 24cm that is reliable. I combined some of the code from the Library with the direct code and now it reliably(ish) without detailed testing will work to 70cm. Once again, I love this Tinkering. It returns always 'out of range', perhaps my sonar is broken.. I know a mistake I made was getting the wires backwards as I mounted the sensor at the edge of the board I had the pins wired incorrectly. Also, check out the 2 links above for other code that might be worth trying. I have afeeling with the cheaper sensors things may not always be 100% as they should be. Finally, if none of that works try messing with the delays in the code above. It might be that thy need to be adjusted for your specific sensor. Echo to Arduino pin 13 Trig to Arduino pin 12 says the comment in the starting of the code, change the pins and it will work! I think its funny as heck seeing some webstores and ebay sellers quoting this unit as accurate from anywhere from 200cm to 500cm!!! Fair Acuarcy to over a meter and near perfect under 60cm is fine by me as its going into a robotics project and I only need it acurate to around 50cm max and in that range this code and the HC-SRO4 is perfect with at most a 5mm(0.5cm) margin of error on any surface. I have noticed that if you get a little dust or a hair or anything like that on the 2 protective meshes then that can make it throw up constant out of range errors as well as throw off results it does publish. Instead of digital output it gives serial output. Can anyone help me with the code for serial communication with a sensor. There are many tutorials for serial communication but all they do is communicate with the PC, Help me read the serial output of this sensor. For 3-pin version - maybe it comes from Parallax? - check out this example: http://learn.parallax.com/kickstart/28015. Arduino code is near bottom of page. Upshot is that Arduino pin connected to "SIG" is set to output to send a ping, and then that same pin is set to input to read the result! Try this as well. I basically got rid of the delay() and replaced it with millis(). This lets the Arduino work on other things without pausing it. Modified code to use without delay() functions. 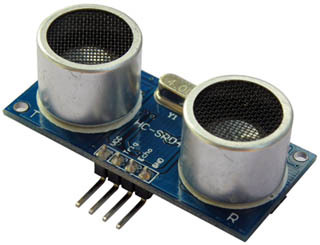 how can we send the data from ultrasonic sensor to cosm?